Generally I would rather be dry than wet, but if I happen to get soaked it’s not a big deal. My phone on the other hand doesn’t do so well and no amount of rice can save a phone that has been completely saturated from the inside out. The best defense is to stop the water before it ever reaches your valuables. 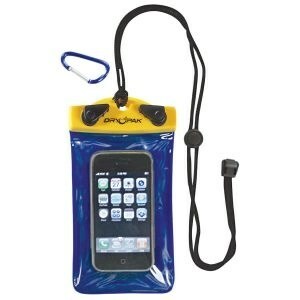 There are options like this $15 phone pouch from Gander Mountain, but alternatives include an airtight box or for the money tight…. Sandwich Bags. They cost about 10 cents a bag and can be bought almost anywhere that sells food. The options for shelter at a music festival are slim and far between but there is usually some sanctuary with an tent/indoor stage. This is the place to be if you plan on staying dry without missing out on the total weekend experience. If the day is going to start off rainy before it progressively clears into sunshine, then start at a tent to stay dry for the long night ahead.This can be a great way to check out some lesser known acts and use the festival infrastructure to your advantage. 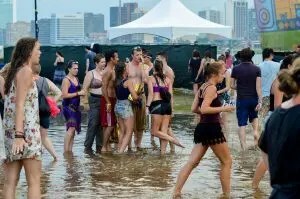 Chicago’s annual Freaky Deaky Halloween festival consisted of 3 stages under tents and that came in handy early on in the third day when rain blanketed the festival grounds. Hanging from the tents at Freaky Deaky 2015. If there is one strong storm front that is quickly going to pass through the area, then maybe you’ll consider the option to “Porta-Party”. If the music is still blasting from the main stage there’s a chance you won’t miss a single note from the closest porta-potty’s and maybe, just maybe, you’ll be able to sneak a peak of the stage from the cracks in the door. After the storm passes you’ll emerge just as “fresh” as the moment you entered. Yeah… They are kind of dorky and you’ll probably look like a bag blowing in the wind, but none of that matters when you, your clothes, and everything with you remains completely dry. 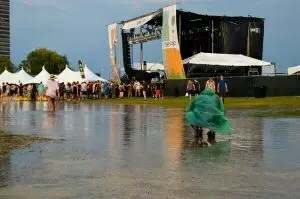 Most festivals won’t allow umbrellas so don’t even try it, they block the view of others and there is the potential of poking someones eye out. Emergency ponchos cost as little as $1, so it’s easy to grab a handful and just in case the weather turns for the worst you’ll have hands free protection from the elements. Music festivals are all about connecting with others and living in the moment so when the ground is saturated, your shoes are soaked, and you’ve lost all hope for a dry experience; just embrace the moment. Dance in the rain, stand in the puddles, and slide through the mud because it’s your weekend to make the most of. All the money and effort that has lead you to this stormy event shouldn’t go to waste in a hotel room or tent waiting for the weather to get better. At the end of the weekend a warm shower and a cozy bed are waiting so when the weather gets wet, get a little wild and let loose in the slippy situation. Pool Part at Mo-Pop 2015.